Take pictures of friends and family – right from your iPhone. You can use photos from your photo library too. 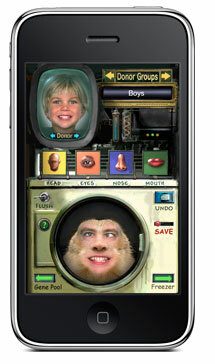 These will become your own “Gene Donors.” We supply tons of ready-to- use faces too. 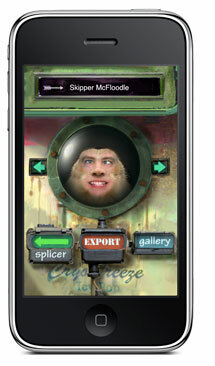 Mix & match faces in the wacky gene-splicing machine. 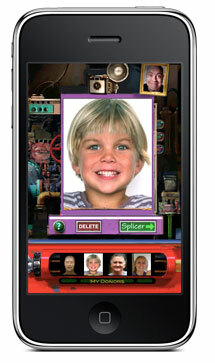 Choose a face part – head, eyes, nose and mouth – from dozens of Gene Donor faces. Millions of Mutant combinations are possible. You’ll be amazed and amused! Store your Mutants in the cool comfort of the Cryogenic Freezer. Come back to view them at any time. 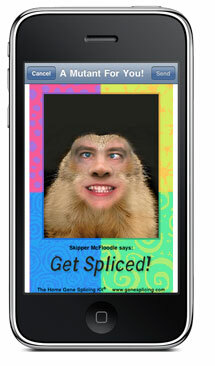 You can email postcards to all your friends right from within the app. There are several fun designs to choose from. Post your creations to Facebook and Twitter too.